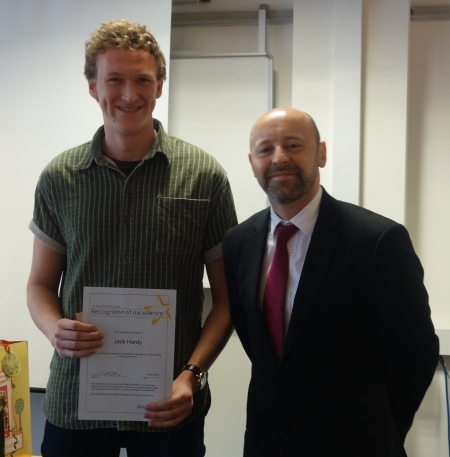 Press Association trainee, Jack Hardy, has become the second recipient of the Nigel Whitefield Award for Excellence in Local Government Reporting awarded by Newcastle City Council. Jack received the award at the Newcastle training centre from the council’s Press Office manager Andrew McKegney, pictured with Jack, left. He was given the prize after achieving the highest marks in the centre’s regular Public Administration tests and after his story about Northumberland County Council’s use of taxis to take children to school, made the front page lead in the Newcastle Journal. The award is named after Newcastle City Council Press Officer, Nigel Whitefield, who died this year following a kidney transplant operation. Jack received his award on the final day of the 17 week course.